This article is about Pichu's appearance in Super Smash Bros. Ultimate. For the character in other contexts, see Pichu. Pichu (ピチュー, Pichu) is a playable character in Super Smash Bros. Ultimate. It was confirmed on June 12th, 2018. Pichu is classified as fighter #19. Pichu's voice actress from Melee and the Pokémon anime, Satomi Kōrogi, reprises her role with new voice clips. Play VS. matches, with Pichu being the 34th character to be unlocked. Clear Classic Mode with Pikachu or any character in its unlock tree, being the seventh character unlocked after Mr. Game & Watch. Have Pichu join the player's party in World of Light. With the exception of the third method, Pichu must then be defeated on Pokémon Stadium 2. Despite not being an Echo Fighter, Pichu is still almost a full clone moveset-wise of Pikachu. As in Melee, Pichu is significantly lighter than Pikachu, and all of its electric attacks inflict recoil damage. Many of Pichu's attributes, such as its run speed, air speed, fall speed, etc. are now different when compared to Pikachu. In addition, most of Pichu's animations have been given slight adjustments and overhauls in order to differentiate them from Pikachu's; for example, all of Pichu's smash attack charging animations are now completely different from Pikachu's. Almost all of Pichu's moves are also functionally different, such as down tilt or neutral air, making it even more unique. However, unlike previous clones, Pichu was not given many new unique moves to differentiate it from Pikachu, as the only unique moves it has are its forward tilt, up smash, neutral aerial, and edge attack. These changes give Pichu some new strengths, but also a lot of weaknesses when compared to Pikachu. Overall, Pichu can kill more reliably than Pikachu and at earlier percentages, which is largely due to its forward tilt being extremely strong. Some of its attacks also deal more damage than Pikachu's, but the only ones with a significant difference are its back aerial and the aerial version of Thunder Jolt. Otherwise, the damage output between the two is largely the same or with only a 1–2% difference, while some some of Pikachu's attacks, like its dash attack, up aerial and Thunder, are stronger than Pichu's. Pichu's frame data is also better on average, with its biggest advantages being on its forward tilt, down smash and Thunder. However, there are some attacks like back aerial and Skull Bash where Pichu's frame data is worse and only Pichu's up aerial auto-cancels in a short hop, whereas all of Pikachu's aerials can auto-cancel in a short hop. Additionally, with the exception of its grab and neutral aerial, almost every other attack in Pichu's moveset has inferior range to Pikachu's equivalent attacks, including all of its tilts and smash attacks, its up aerial and Thunder. Pichu is extremely light and has a high falling speed, which makes it easier to combo and KO. The recoil damage gimmick, while toned down compared to Melee, still makes Pichu's already bad survivability even worse. Pichu is also forced to play very aggressively and cannot camp as well as Pikachu can due to its recoil damage. It also does not have access to Quick Attack either, removing a vital approach and burst option from its arsenal. Lastly, Pikachu and Pichu's combo games are very different, but are at roughly the same power level. For instance, Pichu does not have access to Pikachu's neutral aerial, which is a useful combo tool, and Pichu cannot chain four back aerials into each other at low percents, but its up tilt and up aerial combo for longer, and its down tilt is a better combo starter. All in all, both characters have many up- and downsides compared to the other. There are a lot of arguments that point to either one of them being the better character, but they are definitely both good picks in the meta game and are capable of great results. Pichu's on-screen appearance, idle animations, taunts and victory poses are all different from Pikachu's. In general, most of Pichu's animations are either slightly or completely different than Pikachu's. This includes Pichu's attacking and non-attacking animations. Common animations such as air dodge, back roll, and backflip are all different. Other arbitrary animations (such as Home-Run Bat swing, sleeping, stunned, using shooting items, etc) are also different. All of Pichu's electrical attacks inflict recoil damage. Pichu runs slower than Pikachu (2.039 → 1.892). Pichu's traction is lower than Pikachu's (0.132 → 0.11), making it harder for Pichu to punish out of shield. Pichu's rolls travel less distance than Pikachu's. Pichu's wall jump grants much less height than Pikachu's, going from 3rd best to 6th worst. Pichu's air speed is faster than Pikachu's (0.957 → 1.029). Pichu falls much faster than Pikachu (1.55 → 1.9). However, its fast falling speed is only very slightly faster (2.48 → 2.5). The difference between Pichu's falling speed and fast falling speed is much lower than Pikachu's (increase: 60% → 31.579%), which makes it more predictable when landing and gives it less options in the air. Pichu's gravity is much higher then Pikachu's (0.095 → 0.14). Pichu is significantly lighter than Pikachu (79 → 62). Combined with its high falling speed and high gravity, this makes Pichu easier to both combo and KO than Pikachu. Pichu has a slightly smaller hurtbox than Pikachu overall. Pichu is also taller than Pikachu when crouching and crawling. This means Pichu can't crouch under some projectiles and attacks, like Wolf's Blaster, whereas Pikachu can. Due to Pichu's higher falling speed and gravity, its air dodges have less ending lag than Pikachu's (neutral: FAF 51 → 43; directional: FAF 85 → 71 (side), 110 → 89 (up), 70 → 60 (down)). Neutral attack does not have a sweetspot or a sourspot, which means it deals less damage when close to the opponent, but more damage when farther away from the opponent (1.4%/1.2%/1% → 1.2%). Neutral attack deals more knockback, which causes it to hit less often before being pushed out of range or pushing the opponent off an edge. Neutral attack has less range. Dash attack deals less knockback, which grants it combo potential at low percents, but also greatly reduces its KO potential. Dash attack's clean hit deals less damage (11% → 8%). Forward tilt has less ending lag (FAF 30 → 25). Forward tilt has a significantly longer duration (frames 6-8 → 5-12). Forward tilt always causes the opponent to trip at low percents. Forward tilt cannot be angled, making it near impossible to hit enemies in the air. Forward tilt deals less damage (10%/9%/8% → 8%). Forward tilt causes recoil damage (0.7%). Forward tilt has less horizontal range. Up tilt deals less knockback, making it able to combo for longer. Up tilt has less horizontal and vertical range. Down tilt deals vertical knockback, whereas Pikachu's deals horizontal knockback, which makes it a significantly better combo starter. Down tilt has more range below Pichu, making it easier to hit enemies at the ledge. Down tilt cannot cause the opponent to trip. Forward smash strikes multiple times instead of once. Forward smash has less ending lag (FAF 54 → 50). Forward smash does not have a sourspot. Forward smash's final hit deals more knockback, killing about 10% earlier than the sweetspot of Pikachu's version. Forward smash has slightly more startup lag (frame 15 → 16). Forward smash causes recoil damage (1.5%). Forward smash has significantly less horizontal range. Up smash is an upward headbutt, whereas Pikachu's is a tail flip. This means that the hitbox starts behind Pichu and moves forwards, whereas Pikachu's starts in front and moves backwards. Up smash does not have a sourspot. Pichu's ears are intangible during the three frames its up smash is active. Up smash deals less knockback. Up smash has less range. Up smash has a significantly shorter duration (frames 10-17 → 9-11), which also causes it to have more ending lag despite the earlier FAF (FAF 45 → 41). Pichu moves slightly forward and then backward while using its whole body to attack during its down smash, unlike Pikachu, who stays in place and uses its tail. Pichu's down smash has diagonal knockback, unlike Pikachu's horizontal knockback. This causes it to KO earlier from center stage and across the stage, but later from near the edge. The angle is less desirable for edgeguarding. Down smash deals slightly more damage if all hits connect (13% → 14%) and the last hit deals slightly more knockback. Down smash has much less ending lag (FAF 66 → 51). Pichu is invulnerable for 4 frames starting 1 frame before down smash becomes active. Down smash causes recoil damage (0.8%). Down smash hits one time less with the same duration, which means the rehit rate is slower. Down smash takes longer to hit enemies behind Pichu than those who are in front of it, whereas Pikachu has better range in both directions that is always completely covered. Down smash has less range below Pichu, making it harder to hit enemies at the ledge, even with the final hit. Neutral aerial is a somersault in the air, whereas Pikachu's is an electrical charge. It does not have an electric hitbox and only hits once. Neutral aerial deals more knockback. Neutral aerial has slightly more range. Neutral aerial has a longer duration (frames 3-22 → 3-9 (clean), 10-27 (late)). Neutral aerial cannot be used to perform the dragdown combos, loops and kill setups that Pikachu can do with its neutral aerial. Neutral aerial deals less damage (8.9% → 7% (clean), 5% (late)). Neutral aerial has slightly more ending lag (FAF 39 → 40). Neutral aerial does not auto-cancel in a short hop, making it slightly less safe despite the lower landing lag (9 frames → 7). Every hit of forward aerial deals the same damage, whereas Pikachu deals less damage with the first hits, but more with the last hit. Forward aerial's hits connect more reliably. Forward aerial deals more damage if all hits connect (11.8% → 14%). Forward aerial deals less damage if only the last hit connects (4.8% → 3.5%). Forward aerial hits 2 times less with the same duration, which means the rehit rate is slower and dragging opponents down with it is harder. Forward aerial causes recoil damage (1%). Forward aerial's last hit deals less knockback, reducing its KO potential. Forward aerial does not auto-cancel in a short hop, reducing its combo potential and safety. Back aerial's last hit deals more knockback, which increases its KO potential, but removes its combo potential. Back aerial deals more damage if all hits connect (8.6% → 12.5%). Back aerial deals less damage if only the last hit connects (3.6% → 2.5%). Back aerial can drag opponents down more easily for edgeguarding and combos. Back aerial has a longer duration (frames 4-25 → 5-31). However, the attack hits as often as Pikachu's version, which means the rehit rate is slower. This makes escaping the attack easier. Back aerial has an electric hitbox and therefore causes recoil damage (1%). Back aerial has more startup (frame 4 → 5) and ending lag (FAF 44 → 55). Back aerial does not have a landing hitbox. Back aerial does not auto-cancel in a short hop or a full hop, reducing its combo potential and safety. Up aerial deals less knockback, which increases its combo potential, but reduces its KO potential. Up aerial sends at a more vertical angle, making it easier to combo into Thunder, but also removing the up air loops Pikachu can do at mid percents. Up aerial has slightly less landing lag (14 frames → 11). However, because both Pichu's and Pikachu's up aerials auto-cancel in a short hop, this difference rarely matters. Up aerial deals consistent damage instead of having a clean and a late hit, but also deals less damage (6% (clean), 4% (late) → 4%). Up aerial always puts the opponent into tumble, meaning it can always be DI'd, reducing its combo potential. Up aerial has less range. Pichu's ears are intangible during the first 4 frames down aerial is active. Down aerial causes recoil damage (1.5%). In rare situations, Pichu is able to immediately KO the opponent after ending the loops by moving next to the stage and using down aerial, whereas Pikachu's loops cannot lead into a KO directly. It also deals more damage per loop. Pichu's loops are more situational, because they can only be started in a full hop, whereas Pikachu can start them in a short hop and almost guarantee them after a grab or up tilt. SDI has a bigger effect on Pichu's back aerial than on Pikachu's neutral aerial, which makes it much easier to escape Pichu's loops than Pikachu's. This also means Pikachu can do more loops in a row than Pichu without the opponent falling out. All grabs have less startup (frame 7/10/11 (standing/dash/pivot) → 6/8/9) and ending lag (FAF 37/45/40 → 32/40/37). Standing grab has slightly more range. Pummel deals more damage (1% → 1.4%). Pummel has more hitlag (12 frames → 14), increasing its duration. Pummel causes recoil damage (0.1%). Forward throw deals more damage (10% → 12%) and knockback, causing it to KO at high percents. Forward throw, Pichu's throw with the highest knockback, kills later than Pikachu's throw with the highest knockback (up throw), unless Pichu is standing at the ledge. Forward throw causes recoil damage (0.5%). Back throw deals less knockback, reducing its KO potential while still not being a useful combo tool. Up throw has less knockback growth, allowing it to combo into Thunder at very high percents much better, but also removing its KO potential by itself. Up throw deals more damage (8% → 10%). Up throw deals more base knockback, reducing its combo potential at low percents. Down throw deals more damage (5% → 8%). Down throw releases the opponent much earlier (frame 38 → 26) and has comparatively more ending lag (FAF 52 → 47). This makes it harder to react to, but also noticeably reduces its combo potential. Edge attack has slightly less vertical range. Thunder Jolts deal more damage (Ground/Air: 6%/4.8% → 7%/10%). Thunder Jolts travel slightly farther. Aerial Thunder Jolts cause more hitstun. Thunder Jolts cause recoil damage (0.4%). Aerial Thunder Jolts deal more knockback, which makes them better for edgeguarding, but reduces their combo potential. Grounded Thunder Jolts travel faster, which makes them harder to avoid, but also makes it harder to follow behind them for added pressure. Grounded Thunder Jolts bounce closer to the ground, which makes it impossible to crouch beneath them, but also reduces their vertical range, which makes jumping above them less of a commitment. Skull Bash travels a longer distance. While this makes it better for recovery and allows it to hit opponents from further away, it also makes edgeguarding with it much riskier, as Pichu is more likely to self-destruct if it misses. Skull Bash deals much more damage when fully charged (21.4% → 33%). Skull Bash needs to be charged for a significantly longer time for a full charge. Skull Bash has more ending lag in the air (FAF 75 → 87) and on hit (FAF 22 → 26). Skull Bash deals less damage when uncharged (6.2% → 4%) and when the smash input is used (10% → 7.8%). Skull Bash causes recoil damage (1.5%). Agility travels a longer distance. Agility does not have a hitbox and therefore inflicts neither damage nor knockback, removing a burst option and combo starter from Pichu's arsenal and making its recovery less safe. Agility causes recoil damage (2%). Thunder's cloud has less startup lag (frame 13 → 9). Thunder's lightning bolt has less startup lag (frame 13 → 9). Thunder's lightning bolt deals less damage (8% → 4%) and knockback. Thunder's lightning bolt causes recoil damage if it hits Pichu (3%). Thunder's lightning bolt travels faster. It is harder to react to the lightning bolt. If the lightning bolt hits Pichu, its hitbox has a shorter duration. If the lightning bolt misses Pichu, the bolt will disappear on the ground more quickly, giving it more ending lag, despite the FAF being identical. Creating a wall with the lightning bolt for edgeguarding is less effective. Thunder's discharge has less startup lag (frame 34 → 26) with identical ending lag, shortening its duration (FAF 75 → 67). Thunder's discharge deals slightly less damage (15% → 14%). Thunder's discharge has slightly less range in all directions. This also makes it harder to hit enemies at the ledge with it. Thunder's discharge has more base knockback, but lower knockback growth, which causes it to KO earlier from near the edge, but later from center stage and across the stage. Pikachu's Thunder starts dealing more knockback than Pichu's at 75%. Thunder's discharge always sends the opponent in the direction Pichu is facing. This makes it more reliable, but also means using DI correctly to survive longer against it is easier. Volt Tackle deals more damage (1.5% → 1.6% (loop), 20% → 21% (final)) and knockback. Volt Tackle causes massive recoil damage (3.2% (startup), 0.2% (loop), 3.5% (final)). Since its absence from previous installments, Pichu was infamous of being by far the worst (clone) character in Melee due to its having the worst matchups in the series and often having players label it a “joke character”, especially taking into consideration its bottom tier place. Possibly as a result of this, Pichu has been exponentially buffed in its transition to Ultimate. Pichu benefits slightly from the implementation of rage, as its electrical attacks can now slowly increase its knockback with the recoil damage it receives from them, and can potentially allow it to escape certain kill confirms that would otherwise KO it. Pichu's recoil damage itself has been toned down from Melee, making its electrical attacks less of a detriment to use. Its mobility has overall improved as well, as its walking, dashing and air speeds have increased, and its air acceleration has increased substantially. It can also crawl now, allowing Pichu to approach more easily while being able to dodge certain projectiles. Pichu also benefits from the weakening of SDI, as its multi-hit attacks are much more reliable. On another note, while its endurance is still the worst in the game as it is lighter than even Jigglypuff, its weight was nevertheless increased, allowing it to survive a little bit longer. Despite the many buffs it received, Pichu also received a few nerfs. Some of Pichu's strongest kill options such as its forward smash and up smash have been significantly weakened in terms of knockback, while its neutral aerial has also been weakened in both its damage output and knockback. Pichu can also no longer chain grab with its up throw, greatly reducing its damage-racking potential against fast-fallers. Pichu's own falling speed has not changed since Melee while its gravity has been increased, making it a fast-faller. Pichu's grounded attacks are also less effective for edgeguarding, as its down tilt, down smash and dash attack now send opponents at a much higher angle. Lastly, more of Pichu's moves (most notably its forward tilt and back aerial) use electricity, meaning that more of its moves cause recoil damage. Additionally, unlike other characters, its jumpsquat animation remains the same, while all other characters are now on par with its jumpsquat animation time of 3 frames. Overall, Pichu's buffs greatly outweigh its nerfs. It is no longer an intentional "joke character" like in Melee; instead, it is now a very polarized glass cannon, akin to a min-maxed version of Pikachu with a better punish and edgeguarding game, but significantly worse survivability, considerably less range on average, a less reliable recovery due to Skull Bash having more ending lag and Agility dealing no damage (thus rendering it completely useless as an attack unlike Quick Attack, which also removes an approach and burst tool) and less non-committal options (due to most aerials not auto-canceling in a short hop and most grounded attacks having way less range). 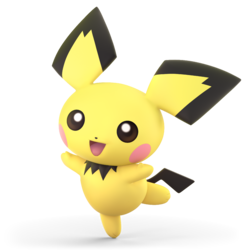 Although Pichu is easier to play than Pikachu, it still has a fairly high learning curve and has amassed good results in tournaments despite that, which will likely place it in either top or high in Ultimate in the long run. Pichu's design and proportions now match the latest games in the Pokémon franchise. Its colors are more subdued than they were in Melee. All of Pichu's non-attack animations are now unique to the character. Pichu is much more expressive. Like Pikachu, its eyes become swirls when dazed, a detail derived from the Pokémon anime from when a Pokémon faints. It also looks angry when dashing. Pichu also now has squash and stretch in its animations, giving it a more bouncy feel than in Melee. Pichu's stance is now mirrored as it faces more on the screen regardless of the direction it turns towards. Pichu has a new idle animation where it wobbles left to right, and an idle pose where it looks back to twitch its tail. Pichu now has an on-screen appearance and an up taunt. Its up taunt has it discharge electricity, emulating Pikachu's up taunt, and then humorously faint afterwards. Its side taunt loosely resembles its left-facing taunt from Melee, and its right-facing taunt is now its down taunt. Pichu's goggles and ribbon alternate costumes no longer have a neck scarf. Pichu has also received five new alternate costumes. Pichu is much more vocal, with more voice lines during certain attacks, or when hurt. Pichu has a new air dodge animation where it twirls in the air at an angle, instead of scrunching up. Pichu no longer appears to sleep while crouching, most likely due to its ability to crawl. Pichu has a new victory animation where it discharges electricity and briefly faints (similar to its new taunt), then gets up and winks at the camera; this replaces the animation from Melee where it jumps and claps with its feet. Its other two victory animations from Melee are updated with new expressions and ending poses, and Pichu now has voice clips for all of its victory animations. Pichu now has a Boxing Ring title, which is "Shockingly Adorable." Pichu can crawl, much like Pikachu. This allows for an easier approach while dodging projectiles. Pichu walks faster (1.24 → 1.302). Pichu dashes much faster (1.72 → 1.892) although relative to the cast, it has the 25th fastest dash speed out of 78 characters compared to the 5th fastest out of 26 characters. Pichu's air speed is higher (0.85 → 1.029). Pichu's air acceleration is much higher (0.05 → 0.1) going from being the 12th highest out of 26 characters to the 9th highest out of 78 characters. Pichu is heavier (55 → 62), which improves its survivability, though it still remains the lightest character in the game. Pichu's gravity is higher (0.11 → 0.14). Due to the introduction of the gravity penalty for knockback, Pichu's vertical endurance is weaker than it otherwise would be, especially since it has above average gravity. Forward roll has less ending lag (FAF 32 → 29). Forward roll grants less intangibility (frames 4-19 → 4-14). Back roll grants less intangibility (frames 4-19 → 4-15) and has more ending lag (FAF 32 → 34). Air dodge has less startup (frame 4 → 2), making it better for escaping combos. Due to its altered mechanics, it also no longer causes helplessness, and allows Pichu to sweetspot edges with directional air dodges. Air dodge grants less intangibility (frames 4-29 → 2-26 (neutral), 2-19 (directional)), and due to the altered mechanics, directional air dodges have more landing lag (10 frames → 11-19) and are significantly less effective for wavedashing. With the implementation of rage, Pichu's self-inflicted damage can gradually increase its launching power, and also keep itself out of kill confirm percentages. Conversely, Pichu's status as the lightest character in the game means it will not be able to survive very well at percentages which allow it to take advantage of rage, and will also die sooner against an opponent who has high rage. The removal of chain grabs immensely aids Pichu's endurance and longevity. However, this also removes some chain grabs Pichu was capable of performing on fast-fallers. Neutral attack has less ending lag (FAF 22 → 17) and it can be looped by holding the attack button. Neutral attack deals less damage (2% → 1.2%). Forward tilt has a different animation. Forward tilt has less ending lag (FAF 30 → 25), increased range, can trip opponents, and significantly increased knockback, being able to KO at high percents. Forward tilt has a shorter duration (frames 5-14 → 5-12) and it has an electric effect, thus dealing recoil damage to Pichu (0.7%). Forward tilt can no longer be angled. Up tilt deals less damage (6% → 5%). Up tilt deals less knockback, improving its combo potential. Down tilt sends opponents at a vertical angle and deals less knockback, making it a potent combo starter. Down tilt deals less damage (7% → 6%) and has a shorter duration (frames 7-9 → 7-8). Its new angle also hinders its edgeguarding and tech chasing potential. Dash attack has noticeably less ending lag (frame 50 → 35). Dash attack has more startup lag and a shorter duration (frames 5-16 → 6-15). It also sends opponents at a more vertical angle, hindering its edgeguarding potential. The late hit deals less damage (8% → 6%). Forward smash's hits connect more reliably. Forward smash deals less recoil damage to Pichu (2% → 1.5%). Forward smash's final hit deals more damage (6% → 8%) although its knockback growth compensated. The multi-hits deal consistent damage due to changes to stale-move negation. Up smash deals less damage (16% → 14%) and knockback. Up smash has intangibility on Pichu's ears for 3 frames. Down smash deals more damage (13% → 14%) if all hits connect and the last hit deals more knockback. Down smash is a multi-hit move with an electric effect making it more similar to Pikachu's down smash. Down smash has an electric effect, dealing recoil damage to Pichu (0.8%). It also has more startup lag (frame 7 → 8) and its new angle hinders its edgeguarding potential. All aerials except back aerial have less landing lag (12 frames → 7 (neutral), 15 frames → 12 (forward), 18 frames → 11 (up), 26 frames → 22 (down)) however due to the removal of L-canceling, their landing lag was not fully compensated. Neutral aerial deals less damage (12%/9% → 7%/5%) hindering its KO potential and has a slightly shorter duration (frames 3-28 → 3-27). Neutral aerial uses its head instead of its tail. Forward aerial causes considerably less recoil damage (1% per hitbox → 1% total). Forward aerial deals more damage (2% → 3.5%), connects much more reliably and the last hit deals more knockback, making it able to KO near the blastzones. The last hit of forward aerial has a shorter duration (frames 22-24 → 22-23). Back aerial has an electric effect, causing recoil damage to Pichu. It also has more startup lag (frame 4 → 5). Back aerial is a multi-hit move with better combo potential and more knockback on its last hit, giving it slightly higher KO potential. It also has less ending lag (FAF 60 → 55). Up aerial deals more knockback and has slightly less ending lag (FAF 28 → 27). Down aerial has a sweetspot that deals more damage (12% → 13%) and meteor smashes opponents, the landing hit no longer has set knockback and Pichu's ears have intangibility during the strong hit. Down aerial can also auto-cancel in a short hop. Down aerial's late hit deals slightly lower knockback..
Pichu's grabs are faster (frame 7 → 6 (standing), frame 11 → 8 (dash)). Dash grab also has slightly less ending lag (FAF 41 → 40). Standing grab has slightly more ending lag (FAF 31 → 32). When grabbing, Pichu swipes one hand sideways, instead of grabbing overhead like Pikachu. Pichu also no longer rolls over after performing a dash grab. Pummel deals more hitlag (4 frames → 14), but has less startup (frame 3 → 1) and significantly less ending lag (FAF 25 → 6), shortening its duration. It also causes much less recoil damage (1% → 0.1%). This makes it vastly safer to use for damage racking. Pummel deals much less damage (3% → 1.4%). The removal of chain grabbing significantly hinders forward throw, up throw and down throw's damage racking potential. All throws except forward throw no longer have an electric effect. Forward throw deals more damage (9% → 12%) and causes less recoil damage (1% → 0.5%). It deals much less hitlag, executing faster as a result. Its first four hits are slower (frame 10, 14, 18, 22 → 11, 15, 19, 23), and it releases the opponent faster (frame 29 → 27) with its total duration unchanged. This slightly hinders its combo potential. Back throw releases the opponent faster (frame 30 → 26), with its total duration unchanged. This increases its ending lag and shortens the distance Pichu moves back before throwing, making it less effective for setting up edgeguards, while still giving the opponent enough time to DI. It is no longer weight-dependent. It has a different animation. Up throw releases the opponent faster (frame 20 → 15) and has less ending lag (FAF 44 → 36), improving its combo potential from low to mid percents. Down throw releases the opponent faster (frame 20 → 19) and has less ending lag (FAF 48 → 40), improving its combo potential from low to mid percents. The first hit has more startup (frame 12 → 14). It deals less damage (5% (hit 1 and throw) → 4%; 10% → 8% total) and has increased knockback, hindering its combo potential at high percents, while still lacking KO potential. Thunder Jolt causes considerably less recoil damage to Pichu (1% → 0.4%) and has less ending lag (FAF 58 → 52). Pichu can no longer fast fall while using Thunder Jolt. Skull Bash causes Pichu to bounce back when it hits an opponent, making it safer to use. Uncharged Skull Bash deals less damage (5% → 4%). Skull Bash deals more recoil damage (1% → 1.5%). Fully charged Skull Bash deals less damage (39% → 33%) and knockback. Agility travels further and causes less recoil damage (1%/3% → 0.6%/1.4%). It also has less ending lag when used into the ground. Red arrows appear when using Agility to show the angle Pichu will travel in. Thunder meteor smashes targets hit high above Pichu and can drag them down into the launching hit. Thunder passes through the stage. While this lets Pichu use it as a close range attack under platforms and such, it also means Pichu can hurt itself doing so. If Pichu uses Thunder, then jumps, and the Thunder hits Pichu, Pichu will rise a bit, which could help its recovery. The electricity discharged when the lightning strikes Pichu is yellow rather than blue and has Pichu flash with a dark tint, and does not cry if struck. Pichu has a Final Smash, Volt Tackle, which is nearly identical to Pikachu's: it has Pichu dash quickly around the stage at different angles while surrounded in a ball of electricity, then launching opponents with an electric blast at the end of the move as the ball disappears. It also causes massive recoil damage, unlike Pikachu's version of the move. Thunder Jolt deals less shield damage. Adjusted hurtbox positioning during aerial hitstun and landing animations. This makes multihit attacks link better, whereas it previously would fall out. Pichu can crawl and wall jump. 1.2% Does a quick headbutt. 8%, 0.7% recoil Plants itself on its upper paws and kicks both its feet upward in front of itself quickly (comes out on frame 5). Can make opponents trip at low percents. Cannot be angled as it could in Melee. One of Pichu's most reliable KO moves at higher percentages thanks to its speed, power, and ability to be spammed relatively safely. 5% Swipes its tail above its body in an arc. Can combo into itself at low percents, or into an aerial at mid to high percents. 6% Swipes its tail in front of itself. Has very low knockback scaling, allowing it to combo into up tilt at low to mid percents, or an aerial even at very high percents. 8% (clean), 6% (late) Jumps and headbutts forward. 2% (hits 1-5), 8% (hit 6), 1.5% recoil Launches a short jolt of electricity from its cheeks. 14% Does an upward headbutt. Pichu's ears become intangible on frames 9-11. 1.5% (hits 1-4), 8% (hit 6), 0.8% recoil Discharges electricity while quickly spinning in place. 7% (clean), 5% (late) Somersaults in the air. A quick out of shield option. 3.5% (hits 1-4), 1% recoil Does a forward barrel roll. Can combo into itself at lower percents. 2% (hits 1-5), 2.5% (hit 6), 1.0% recoil Does an electric spin similar to its down smash. 4% Flicks its tail above itself. 13%, 4% (landing), 1% recoil after startup, 0.5% recoil landing (can land before startup) Does a downward barrel roll. Has the capability to meteor smash opponents. Pichu's ears become intangible for the entire duration (frames 14-17). — Quickly leans forward and grabs with one arm. Has a range of approximately Pichu's body width. 1.4%, 0.1% recoil Shocks the opponent. 1.5% (hits 1-4), 6% (throw), 0.5% recoil Places the opponent on its back and shocks them, sending them forward. 9% Does a backwards somersaults with the opponent, then flings them behind itself. 5% (hit 1), 5% (throw) Tosses foe up and headbutts them. Can infamously combo into Thunder making it a reliable finisher between medium and high percents. 4% (hit 1), 4% (throw) Places opponent on the ground, then jumps on them. Can combo into an aerial at low to mid percents. 7% Does a full rotation sweep with its tail. 5% Swings its tail on both sides of itself. 9% Climbs up then flicks its tail out. Thunder Jolt 7% (short distance), 6% (medium distance), 5% (long distance), 10% (ball), 0.4% recoil Pichu's main projectile. Fires a jolt of electricity forward. It travels forward while bouncing along the ground, and can also travel up walls, below the edge, and along ceilings. If used in the air, it will travel diagonally down instead. Disappears after around 3 seconds. Can be used to gimp certain recoveries. Deals less damage the farther it travels. Skull Bash 4% (uncharged), 7.8% (uncharged smash input), 33% (fully charged), 1.5% recoil Charges and, when the B button is released, fires itself forward like a missile. When fully charged or close to fully charged, it has KO power. The move can also be used to extend Pichu's recovery, though it does have some lag. Compared to Pikachu's Skull Bash, Pichu's Skull Bash deals more damage and covers more distance when fully charged, but deals less damage when uncharged, takes longer to fully charge, causes recoil damage and has more endlag. Agility 0%, 0.6% recoil (warp 1), 1.4% recoil (warp 2) Pichu's primary recovery move. Moves at warp speed in two directions that can be selected via the control stick. Compared to Pikachu's Quick Attack, Agility travels farther. However, it deals no damage and Pichu suffers recoil damage. Thunder 14% (shockwave), 4% (thunderbolt), 6% (thunderbolt meteor), 3% recoil Summons a thundercloud from which a lightning bolt comes down and strikes Pichu. The start of the bolt has a meteor effect and deals more damage than the rest of the bolt. When the bolt hits Pichu, a shockwave is generated than has the potential to KO. Pichu also gains intangibility for 10 frames if it connects, just like Pikachu. Compared to Pikachu's Thunder, Pichu's Thunder has less startup but deals less damage and knockback overall and causes recoil damage. Volt Tackle 0.3% (6 hits during startup), 1% (initial hit), 1.6% (loop), 21% (launch), 3.2% recoil (startup), 0.2% recoil (loop), 3.5% recoil (launch) Pichu turns into a ball of electricity and dashes forward. Any opponents hit are knocked into the center of the screen where Pichu furiously tackles them from multiple directions then releases a powerful electric blast in the center. If the dash doesn't hit an opponent, the final smash is ended early. Jumps out from a Poké Ball and waves both hands in the air with joy before landing. Up Taunt: Charges up with electricity, similar to Pikachu's up taunt, but falls back dazed at the end. Side Taunt: Jumps up and waves at the camera, saying "Pichu!" This was its left-facing taunt in Melee. Down Taunt: Squirms around on the ground, saying "Pichu!" This was its right-facing taunt in Melee. Turns and looks at its tail. Cheers twice (facing to the right first and the left second), jumps thrice while spinning, and poses with its left hand raised. During the jumping, it says "Pi-Pi-Pichu!" Jumps three times, with the third jump, which is done while spinning, being higher than the first two. While in midair, Pichu waves both of its arms. After landing, Pichu raises both of its arms and arches towards its left side. During the pose, Pichu says "Pichu Pichu!" Charges electricity, making itself dizzy, then stands up and winks. Captain L - Placed 5th at Don't Park on the Grass 2018 and 33rd at GENESIS 6. Eon - Placed 2nd at SoCal Chronicles, 13th at Heart of Battle and 49th at GENESIS 6. Nietono - The best Pichu player in Japan and one of the best in the world. Placed 9th at Umebura SP 2 and 49th at GENESIS 6. VoiD - The best Pichu player in the world. Got 9th at Let's Make Moves, 1st at Super Splat Bros, 1st at SoCal Chronicles, and 2nd at GENESIS 6 (where he also used Wolf in some matches). Yetey - The best Pichu player in Europe. Got 5th at Valhalla II and 1st at Schism 3. Pichu fights against opponents that are lightweights like itself. 2 Squirtle Peach's Castle Road to Viridian City - Pokémon Red / Pokémon Blue Squirtle's Pokémon Trainer is absent. 5 Kirby and Meta Knight Skyloft Butter Building (for 3DS / Wii U) This battle is a free-for-all. Although Pichu does not appear in the World of Light opening cutscene, it was vaporized and later imprisoned alongside the rest of the fighters (sans Kirby) when Galeem unleashed his beams of light. To access Pichu, the player must enter the Power Plant sub-area and reach it on a platform with the use of two Zapfish, where it can then be challenged and recruited. Pichu's Fighter Spirit can be obtained by completing Classic Mode. It is also available periodically for purchase in the shop for 500 coins. Unlocking Pichu in World of Light allows the player to preview the spirit below in the Spirit List under the name "???". As a Fighter Spirit, it cannot be used in Spirit Battles and is purely aesthetic. Each Fighter Spirit has an alternate version that replaces them with their artwork in Ultimate. Using its up smash next to Mewtwo on Spear Pillar. Pichu using its up smash on Wario on Pilotwings. Pichu using its Final Smash, Volt Tackle, on Mega Man on Pokémon Stadium. Using a Rocket Belt with Pikachu in Mario Galaxy. With multiple Pichu, Pikachu, and Incineroar on Paper Mario. A dazed Pichu next to Rosalina in The Great Cave Offensive. Pichu taunting at Ryu failing to perform a Hadoken. Pichu sleeping next to Zelda on Tortimer Island. With Pikachu and Alolan Raichu on Yoshi's Island. Pichu and Young Link share the longest gap between playable appearances in the Super Smash Bros. series, with seventeen years between Melee and Ultimate. One of the poses Pichu strikes in its new taunt resembles its trophy from Super Smash Bros. for Nintendo 3DS. Pichu is the only veteran absent from SSB4 to not appear in the full group artwork version of the box cover. Pichu is the only veteran who is unaffected by the new universal 3-frame jumpsquat; in Melee, its jumpsquat animation also took three frames to complete. Pichu's fast fall provides the smallest change to its falling speed when compared to any other fighter. It increases its fall speed by only 31.579%, compared to the usual 60%. One of Pichu's alternate costumes is the Spiky-eared Pichu from Arceus and the Jewel of Life and Pokémon HeartGold and SoulSilver. Being one of a kind, the Spiky-eared Pichu is female, making it the only one of Pichu's alternate costumes with an implicit gender. As of Ultimate, Pichu is the only character who takes damage while using their Final Smash. In a Stamina match, Pichu cannot be KO'd by its Final Smash, as its HP will never go below 0.1 while the Final Smash is active. This also makes Pichu the only character so far that can take damage from all of its special moves. This page was last edited on April 18, 2019, at 18:02.